Have you tried baking eggs before, for a crowd it is so easy!! We have been doing this for just the three of us many times too! 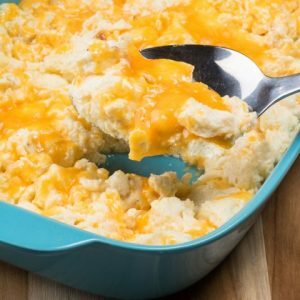 We adore how wonderful these Cheesy Baked Scrambled Eggs turn out, fantastic each time we make them. I love big fluffy eggs and you get that when they are baked in the oven. Then load them up with cheese and they are divine!! We love having eggs for dinner too! That is when we like having these baked eggs the most! We cook up some Perfectly Crispy Baked Bacon also in the oven for our dinners. Cleanup is easier all around!! We also all feel spoiled having breakfast for dinner, a great treat!! 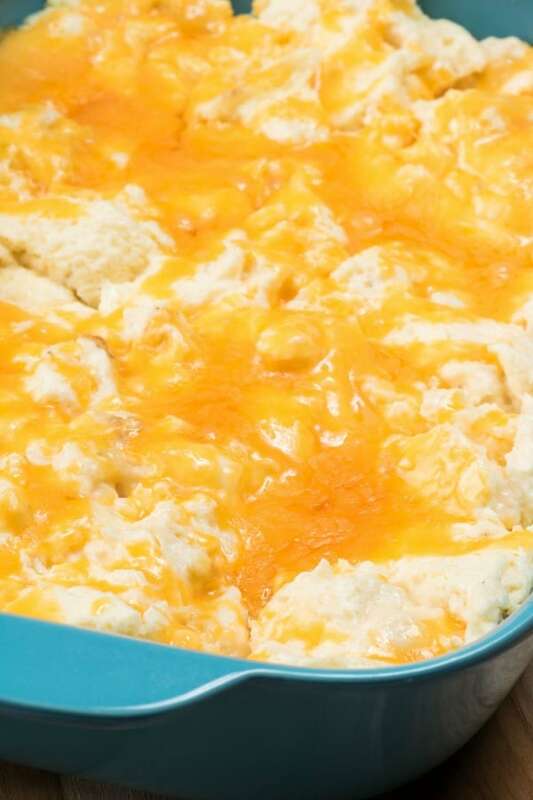 Fluffy, moist eggs, loaded with a cheesy top will have everyone running to the table to feast!! Kids love scrambled eggs too!! Pass the fresh fruit around that you have whipped up into a fruit salad. Everyone loves that also! So gorgeous anytime of year but even more so in the summer when produce is at its finest. I have to admit I am not a great scrambled egger! I leave that task up to Ken who is the breakfast aficionado. He does the eggs, bacon, toast and fixins’ way better than I could ever. So it is Ken that is in the kitchen creating this dish for us. He knows not to overcook the eggs, to keep them moist, to never let them get rubbery or nasty. If you have issues cooking eggs then this baked method is for you. Sit back, relax and poke your head in the oven when needed. You will love cooking scrambled eggs like this from now on! 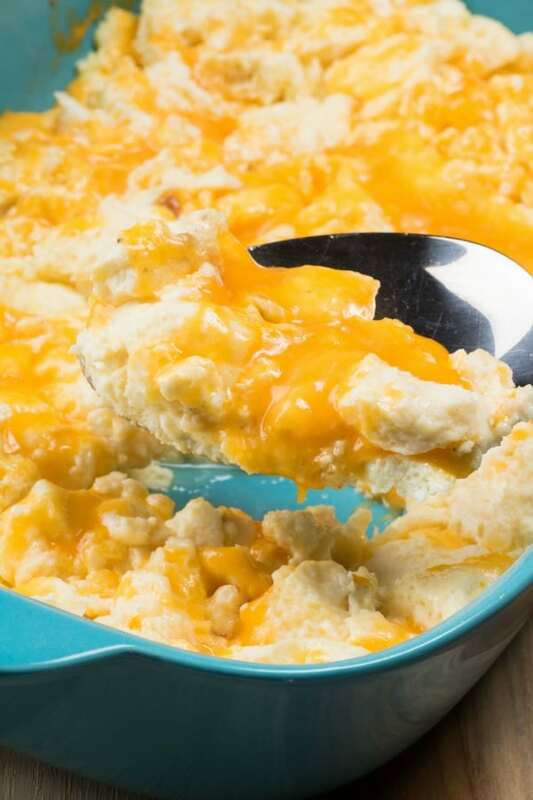 Easy to make and perfect eggs each time with Cheesy Baked Scrambled Eggs! Make them from breakfast, brunch of dinner. Foolproof for feeding a crowd. Preheat oven to 400F. Grease an 8x11" pan with the 1 Tbsp. butter and set aside. Whisk eggs with the salt, pepper, and cream. Pour into prepared dish. Bake uncovered for 10 min. Stir and bake for another 5 min. Repeat every 5 min. until almost completely set, don't overcook. May take a total of 20-25 min. Top with cheese and bake until melted. Serve immediately. Eggs are a blank canvas just waiting for additions!! Enjoy!! These look so tasty. We are huge scrambled egg fans in our household. I could see throwing some broken up bacon into this recipe and it would be a huge hit in our house. This looks amazing! I am going to make this when we have family visiting next week! Oh my! I want to make that for breakfast tomorrow morning! This looks simply divine! That looks absolutely fantastic! There’s nothing better than cheese and eggs! Om nom nom. These are sure to be a hit in my house. I am always looking for easy breakfast recipes to try. These look so delicious and easy to make .I will have to get the ingredients need to make some this weekend for brunch. What a cool new twist on scrambled eggs. This is definitely something to try on a weekend morning. I can’t wait to try this recipe. I’m sure that my household will love it. I love cheesy eggs! I am going to have to give these a try. I know that my kids will love them. What a great idea to bake scrambled eggs. I bet my husband would like this verses scrambling them everything morning. I can’t believe you made this int he oven- genius! I’ll have to whip this up the next time I make cinnamon rolls! The eggs look super fluffy. I love the ingredients you used. These look so delicious! I would eat this every morning! Just in time for Father’s Day! Thanks for the inspiration Tara! About how long do they take to cook? 30 min? An hour? Just wondering how early I should get up! May only take 20-25 min. depending on how you like them done. Don’t overcook them though and just watch towards the end. I changed this in the recipe. I used 2% milk and they were perfect. Have you ever doubled the recipe and still cooked in a 9×13 pan? I have not doubled the recipe yet but would try it for sure. We have made all different amounts though. What if you only want to make enough for yourself and a two year old? I feel like 12 eggs might be too much :/. We have halved the recipe succesfully too or you could try a third or quarter. See what works for you.